Wine begins with the grape. If you enjoy wine, you must first appreciate the grape. Put another way: If you love wine, if you consider yourself somewhat a student of wine with an open mind toward learning, you must be open to new tastes, and new tastes mean tasting wine from different grapes. A grape, perhaps, you are not familiar with is Sagrantino. The bottle I enjoyed was from Scacciadiavoli, a 2004. Don’t think at ten years of age, such wines are past their prime. Sagrantino is a wine grape among the highest in polyphenols, chemical compounds which include tannic acid. Tannin is found in grape skins, seeds and stems and allows for the wine to smooth out so uniquely and so deliciously but over time. The grape is very thick skinned (lots of tannin) and it’s fortunate to be so because it took much abuse in the early 1970s, a time at which many farmers considered ripping out Sagrantino and replanting with varieties assumed to be more sellable. 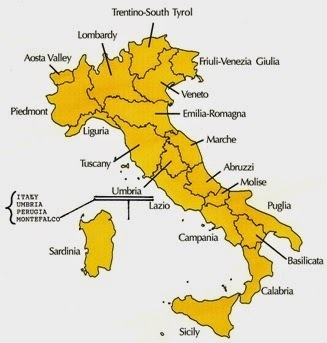 Thanks to a collective of Umbrian farmers (see map) with a persistent dedication and belief, Sagrantino not only survived, it prospered. Its loss would have been historical. References to Montefalco date back to the 11th century. Pliny the Elder referred to the area, although we don’t know that Sagrantino was then planted. We do know that Sagrantino is grown only in the small, hill top area of Montefalco in Umbria, Italy. And genetic testing on Sagrantino has not discovered analogies with other grape varieties. In 1992, Sagrantino di Montefalco was awarded DOGC (Denomination of Controlled and Guaranteed Origen) status. Its loss would have been historic. Wine labeled as Montefalco Sagrantino is available as dry (secco) or sweet (passito). These are powerful wines with the dry having an alcohol requirement of at least 13%, and the sweet at 14.5% (Scacciadiavoli’s came in at 14.5% despite being dry). There is also a Bianco, made from another grape entirely (Grechetto) and subject for another discussion. And to avoid confusion, be aware there is also a Montefalco Rosso, a blend primarily of Sangiovese, often 70%, with as little as 10%-15% Sagrantino. While delicious in their own way, tasting these wines will not give you the benefit of appreciating the wondrously unique quality of the Sagrantino grape. The photo here shows a bottle of the dry (secco) and it is that which enraptured me at first taste. While powerful, this is a wine of great balance. In the glass, the wine shows as very dark garnet. Open, sniff and enjoy aroma of blackberry, but don’t drink. Chances are this wine is older than some things you own, even if you recently purchased the bottle. In addition to being 100% Sagrantino, the wine may only be released after 30 months’ aging (of which 12 must be in wood barrel). Aging, in fact, may be even longer. Decant gently or allow it to breathe for a few hours. You will be rewarded with tastes of plum, blackberry, and cinnamon. I enjoyed a hint of licorice that developed into anise in the finish. Another taster detected hints of pork fat, which I did not. The wine has great depth, the nose is deep, and the finish long – everything about this wine is enjoyable. Despite the grapes natural tannic qualities, the long aging requirement for Montefalco Sagrantino result in those tannins being tamed. You can enjoy the wine shortly after purchase. But allowing it more rest in the bottle in a cool dark area will improve the wine even more, allowing it to become smoother and more velvety in the mouth. Some of these wines can be cellared 20 years. As with any varietal, style is influenced by vinification. Scacciadiavoli (pictured) and Pericaia tend to be lighter (for me) and more elegant. Capria and Tabarini produce wines more robust. Both styles are eminently enjoyable. Enjoy Sagrantino at 64F with grilled meats and dark sauces or game meat and strong (hard) cheeses. With Easter here, you will find this wine an excellent accompaniment to lamb. Sagrantino is Montefalco’s gift to the world and at $30-$40 ARP, Montelfaco is being generous.